Charlie Troop had six months to save a forgotten Afghan district. But what, and who, would they leave behind? WHEN CHARLIE TROOP went out on missions, Major Roy Rogers usually liked to ride in the lead vehicle. But early on the morning of May 7, 2012, it looked like the scheduled patrol might be called off. It had rained during the night and, if the ground was too muddy, the heavy armored trucks ran a risk of becoming stuck. Rogers and the 100-odd men comprising Charlie Troop had been in Giro District—on the remote eastern edge of Afghanistan’s Ghazni Province—a little more than a month, long enough for them to know that getting bogged down outside the wire was a situation best avoided. Set among bald hills and craggy mountains that ringed a sprawling desiccated plain, Giro was only about 100 miles south of Kabul but it might as well have been another country altogether. For years, Charlie Troop’s predecessors, a group of Polish coalition soldiers, had failed to secure much beyond a tiny, embattled outpost on a low rise overlooking miles upon miles of Taliban-dominated villages and desert. Now, during the twilight of the war, Charlie Troop had been given six months to try to turn things around and create some conditions that the Afghan security forces could handle on their own. As the weather cleared, word came down that the mission was a go, and the soldiers piled into their trucks. Rogers, a towering 37-year-old Kentuckian with a sly Southern drawl blunted by a long, itinerant military career, headed for the front of the convoy. Rogers was the highest-ranking officer with Charlie Troop but not its commander. His job was to mentor the Afghan police and soldiers—to prepare them as best he could for the imminent U.S. withdrawal. It was a daunting task. The Taliban held far more sway than the government over Giro’s inhabitants, and the Americans had quickly discovered that you could barely step outside the base without getting shot at. One platoon was attacked on 14 consecutive patrols. Giro was so far behind other parts of Afghanistan that Charlie Troop’s objective on the morning of May 7 was simply to make contact with elders in villages where coalition forces had yet to go. The lead truck was a multi-ton personnel carrier with a third axle, called a mine-roller, extending out in front to detonate pressure-activated bombs in advance of the vehicle itself. Rogers found Sergeant Jacob Schwallie sitting up front on the passenger side and Specialist Chase Marta behind the wheel. In back, Sergeant David Griffis and Private First Class Dustin Gross faced one another in a dark metal compartment cluttered with wires and gear. Occupying a mini-console of sorts, Private First Class Destrey Groom watched the world outside on a video feed that followed the muzzle of the roof-mounted machine gun he controlled with a joystick between his knees. That Schwallie’s squad had grabbed the lead was no surprise. An experienced Iraq veteran, Schwallie felt that soldiers without children could tolerate a higher level of risk than soldiers with: Since, among them, Griffis alone was a father, Schwallie often volunteered to take point. Major Rogers jumped in a vehicle farther toward the rear, and the convoy headed south through a desolate, sparsely populated landscape. A few nomads herded sheep over thorn-bush and rock; thin streams—too shallow and turbid to bring forth much other than mossy stones and spindly grass—carved the scorched terrain; here and there, impoverished villagers worked modest fields of wheat. After moving on from their meeting at the first village—which passed without incident—the platoon soon arrived at a deep and wide wadi (a dry gravel stream bed). Because the banks of the wadi were too steep to drive up or down, Schwallie and Marta had no choice but to cross it on a well-traveled road that cut a gentler grade. The road presented a natural chokepoint, but there was nothing for it. When they reached the far bank of the wadi and began to climb the incline, it looked for a moment like Marta hadn’t gathered enough momentum to gain the top. Sergeant Griffis urged Marta on; as the mine-roller crested the lip of the bank and the truck leveled itself onto the flat, he laughed and congratulated Marta on the job. Major Rogers had seen his fair share of improvised explosive devices (IEDs) during previous deployments to Iraq. But nothing had prepared him for the spectacle of destruction he encountered when he reached the far side of the wadi. Later, a technician would estimate that the bomb had contained some 250 pounds of explosives. Worse, it had been detonated manually, via a command wire from a nearby village, after the mine-roller passed over it. The blast had obliterated the vehicle, splitting apart its front and rear compartments, sending massive tires and twisted chunks of thick steel hull more than 100 meters in every direction. A yawning crater hollowed the ground where the device had been buried. Remarkably, the passenger compartment had survived the explosion more or less intact, and when Rogers reached the smoking wreckage, he noticed, improbably, someone inside, throwing pieces of metal around, rifling through the debris. Sergeant Griffis had already helped a severely injured Groom out of the compartment and crawled back in to search for his rifle, from which the Army drills into every soldier, from basic training on, never to become separated. “Were you in there?” Rogers asked him, incredulous. Griffis seemed preoccupied. “Yeah,” he said. Back at the outpost, the quick-reaction force (QRF) received word of what had happened and set off to help. One of the paratroopers in the QRF was a private first class from Tri-Cities, Washington, named Derik Moe. A 19-year-old in a hurry to grow up, Moe already had a 30-year-old wife and two stepdaughters, ages five and eight. He loved the Army and venerated the more senior guys who had some combat behind them. One of the sergeants Moe admired most was Jacob Schwallie. When Moe, fresh out of basic training, first arrived at Fort Bragg, North Carolina, Schwallie had been his team leader. Schwallie had made a project of him—had kind of taken him under his wing. Even after he was transferred to a different platoon, Schwallie continued to look out for Moe. When Moe heard the news—three killed in action—he knew that chances were good it had been the lead truck: Schwallie’s truck. Moe and the other drivers in the QRF convoyed toward the blast site as fast as they could. About halfway there someone shot a rocket-propelled grenade at Moe’s vehicle. The rocket hit the front driver’s-side tire—just under Moe’s window—then bounced off and exploded a few feet away. When they got to the wadi, Moe saw that the outer layer of the tire had been split wide—like an over-ripe pomegranate. But he didn’t have much time to consider his luck before someone came up to him and spoke the dead men’s names: Gross, Marta, and Schwallie. The claim was specious, at best. Compared with the same month in 2009 (the year before the surge began), May 2012 saw a twofold increase in the amount of insurgent direct fire, indirect fire, surfaceto-air fire, and IED attacks. Meanwhile, the Haqqani network and Al Qaeda persevered in the east, and the Taliban continued to reject the possibility of peace talks. While Obama’s surge might have regained lost ground in the south—in places like Helmand and Kandahar—the insurgency seemed to have simply shifted into other regions with fewer coalition troops, including a number of areas alarmingly close to the capital, where they remained comfortably entrenched. In Ghazni Province, for example, the Taliban administered its own government and court system, sheltered foreign fighters, stockpiled weapons, and murdered with impunity. This was why, in March 2012, the military had flooded Ghazni with 3,000 paratroopers from the 1st Brigade Combat Team of the 82nd Airborne Division—including Charlie Troop—for the final six months of the surge. It was why, almost eleven years into the war, while everywhere else in Afghanistan troops were drawing down, Schwallie and his guys were leading a convoy to a village where no Americans had ever been. A couple weeks after Obama’s speech at Bagram, the leaders of 28 nato nations, convening in Chicago, pronounced the beginning of the end of the war. After nearly a half-trillion dollars and thousands of dead, the president, this time, declared, “We’re now unified behind a plan to responsibly wind down the war in Afghanistan.” But can the war in Afghanistan really be responsibly wound down, like a party gotten out of hand? During the two-day summit in Chicago, four Americans were killed in Afghanistan, and today, others are still fighting and still dying, sometimes in places that we have already lost. In Giro, the likelihood that Charlie Troop would take casualties was always high. What, though, was the likelihood that these sacrifices would accomplish anything? A FEW WEEKS after Gross, Marta, and Schwallie were killed, I traveled to Ghazni to spend some time with Charlie Troop. Their base, Combat Outpost Giro, sat on the outskirts of a now-destitute village called Pana. Before the resurgence of the Taliban in Giro in 2006, Pana had been a relatively prosperous district center. A tree-lined bazaar filled with shops powered by an extensive system of solar panels attracted patrons not only from across Giro but from neighboring areas near and far. A well-attended high school offered the equivalent of a twelfth-grade education. A health clinic, refurbished by the U.S. Agency for International Development in 2005, was staffed and stocked with medical supplies by a foreign NGO. And a cell-phone tower, operated by technicians who lived full-time in a room at its base, provided service for three national networks. By the time Charlie Troop arrived, though, the clinic was boarded up, the doctors and nurses gone, the medicines on its dusty shelves pilfered or expired; the school was shuttered; the cell-phone tower had ceased to operate (its technicians having fled); and every stall in the bazaar, except for one, had long since been abandoned, their mud walls crumbling to the ground. By this point in their deployment, Charlie Troop had gathered enough intelligence on the insurgency in Giro to plan some clearing missions in the lawless outlier villages surrounding Pana. One of the first was to a place called Azmat, about three miles to the south, where Charlie Troop suspected several Taliban commanders hoarded large weapons caches and IED-making materials. Walking out in front of the patrol to Azmat was Sergeant Griffis. In May, after being airlifted from the wadi, Griffis and Groom had been taken to a medical center on a large U.S. base in neighboring Paktika Province. While Groom had a fractured spine, Griffis’s injuries were relatively minor: a bruised-up leg, some nasty cuts, a badly sprained ankle. The day after he was admitted, Griffis called his commander and asked to come back; the next morning, he jumped on a helicopter bound for Giro. For about three weeks, while his ankle healed, Griffis hobbled around the outpost on a pair of crutches. Today’s mission to Azmat was one of his first ventures back outside the wire, and he was understandably nervous. When first light leaked over the Jarkanah Ghar mountains—revealing a flat expanse, checkered by sporadic plots of green, stretching as far west as the snow-capped foothills of the Hindu Kush—they descended on the village. While the Americans waited outside, the Afghan soldiers and police searched one compound after another, including a massive, castle-like structure that belonged to a known Taliban elder named Haji Zahir. Framed photographs of martyred insurgents decorated several of Zahir’s rooms—but the only people home were women and children. The villagers, who had never seen American troops come through Azmat, seemed amused. They not only readily admitted the Taliban controlled Azmat; they took for granted that they would go on doing so indefinitely. After effectively vanishing from the village during the patrol, the insurgents were keen to reinforce this assumption. Griffis was guiding the platoon through a wide field during its return to the base when what sounded like a dull explosion made everyone stop and peer back toward Azmat. A few seconds later, a screaming whistle bore down on us, someone yelled, “Incoming!” and the paratroopers dropped flat, turning faces against the dirt, waiting for the boom. It was surprisingly close, some 50 yards from the rear of the patrol, impacting with a crash—probably a recoilless rifle, or maybe a mortar, launched from a distance but with impressive accuracy. Suddenly, the rapid bursts of an automatic weapon clattered from the west, and bullets whizzed by us so close we could hear not only the high-pitched zing of their speed but also a kind of trilling vibration. During a lull in the attack, the Afghan soldiers sprinted back up the hill we had just descended and directed volleys toward a cluster of compounds that stood between us and Azmat. Many of them lacked bulletproof vests and none wore helmets. They sported mismatching ensembles of obsolete U.S. camouflage, canvas ammo pouches, shabby Afghan uniforms, and moth-eaten winter beanies. While the platoon leader, Lieutenant Nasrullah Mohamadi, a diminutive Uzbek from northern Badakhshan Province, spurred his men to keep up their barrage, a squad of paratroopers began returning fire as well. Someone thought they spotted shooters atop a hill just behind the village, and now several armored vehicles, which had been standing by as a QRF, turned their 50-caliber machine guns on its ridge-line. Meanwhile, thousands of feet above us, a Predator drone, piloted by someone in the United States, captured with its surveillance camera two men crouching behind a garden wall, shooting at us with a belt-fed machine gun. When the men disappeared into a nearby compound, Major Rogers brought the Afghans back to the village to look for them. As they hunted through homes and alleyways, the drone pilot relayed to Combat Outpost Giro, via a chat program, that the insurgents had escaped on a motorcycle to another village called Bahar, north of Azmat, where they had dismounted and were now hiding in a tree-line. While the QRF drove toward Bahar, Griffis and his platoon headed up a tall hill that overlooked the surrounding villages and farms. At the summit, Taliban fighting positions—dugouts and fortified gunners’ nests constructed from stacked boulders—faced every direction. As the paratroopers surveyed the lowlands, bullets came zipping from the west, cracking on the rocks. Griffis crouched beside a gunner, scanning the distance for something to shoot. “Light up the ridge-line!” someone yelled, and the paratroopers proceeded to intermittently fire and hide from the incoming rounds. As the Predator pilot, refocusing his surveillance, filmed the enemy gun team retreating down a slope, he relayed that he was “reasonably certain” they were the same men who had fled to Bahar. Prohibited from engaging them (over the years, the military command in Afghanistan has restrained the use of airpower in many circumstances to minimize the risks of inadvertently killing civilians), the pilot watched the two insurgents get on their motorcycle and ride back to Azmat, where they entered the castle belonging to Haji Zahir. 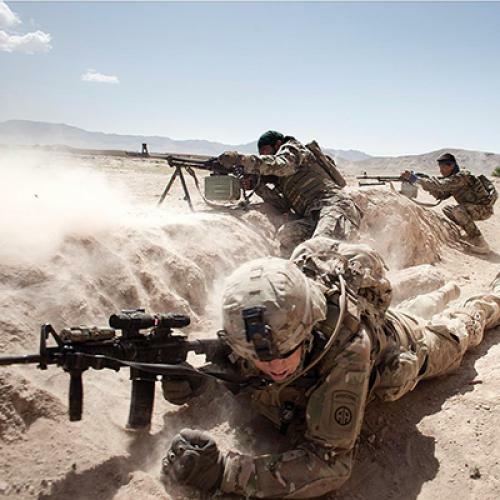 As the QRF turned away from Bahar and headed toward Zahir’s, the two insurgents, alerted by a spotter, once more fled to another compound farther west. The Predator pilot updated the QRF, which altered course. Now, as the paratroopers approached the new target, a child appeared on its roof, gazed in their direction, then vanished inside. Seconds later, the two insurgents, presumably warned, were riding away again, this time enacting a scene that had occurred many times before: a colossally overmatched enemy escaping out of reach. In Musali, the Afghan platoon leader Lieutenant Mohamadi gathered about a dozen elders and sat them down along a narrow waterway on the bank of which large roosters strutted under the shade of green-leaved poplars. A boy appeared carrying a plastic tray with glasses, sugar, and a pot of tea. The boy had just finished pouring Mohamadi a glass when bullets fired from outside Musali cracked in the branches above him, raining down leaf and bark. Mohamadi seemed not to mind—or rather, made a show of seeming not to mind. He continued enjoying his tea with small, careful sips, taking the time to blow slowly on it first. Somewhere nearby, more shots rang out. By now, the paratroopers had identified gunmen firing into Musali from multiple directions, at least four or five concealed positions. One squad headed to the eastern edge of the village, where they lay behind a low berm and fired across a clearing into a thick wood-line within which vague figures moved about. Moe’s team hurried across Musali onto a rooftop and began engaging a different enemy element to the north. Before climbing onto the roof, Moe kneeled behind a wall, propped his rifle on top, and fired toward a building some 400 meters away. During the exchange, a bullet smashed into the wall just under Moe’s weapon, close enough to count. Around this same time, a squad to the south noticed rounds coming from that direction as well. Ten minutes after our arrival, the insurgents had Musali surrounded. Soon two Kiowa helicopters were circling the village at low altitude, hunting for targets. Just as the Kiowas came within range, the insurgents in the wood-line started shooting at them with rifles and machine guns. From a village farther north, someone also fired at the Kiowas using a large Russian anti-aircraft gun. About a week earlier, Taliban fighters in Qarabagh, a district bordering Giro, managed to bring down a Kiowa, killing its two pilots, and now the insurgents in Musali appeared inspired by the achievement. Perhaps the Americans were affected, too. Over the next half hour, the pair of Kiowas unloaded an extraordinary amount of firepower: one missile after another radiantly exploding in the trees. Nevertheless, the Taliban continued fighting. At one point, a white van even dropped off reinforcements. Eventually, the last of the insurgents absconded or were killed. But even so, as the paratroopers left Musali, it was difficult to say what had been accomplished. If anything, the visit seemed to have had an opposite effect than the one intended. As Stanley McChrystal—the general who brought counterinsurgency (coin) to Afghanistan—used to emphasize: “Protecting the Afghan people is the mission.” But people in Musali had seemed more frightened than relieved by the appearance of American and Afghan soldiers in their village. And why shouldn’t they be? They knew as well as Private Moe what the visit would unleash. This has always been a fundamental problem with coin. The tactic was most aggressively practiced during the surge in 2010 and 2011, but these were also the years when the most Afghan civilians were injured and killed. One of the more interesting lessons of the coin experiment in Afghanistan is how little it has mattered to Afghans that insurgents were responsible for the overwhelming majority of these casualties. Rather, what has mattered is this: Where foreign forces go, violence follows. It would be nice to be able to view Giro as anomalous—an isolated backwater where the surge failed. But the security situation throughout much of Afghanistan stands in stark relief to President Obama’s characterization of victory. This November, the most recent month for which statistics are available, the number of insurgent-initiated attacks was significantly higher than in November 2009, the month before Obama announced the surge. And recently, an exhaustive analysis of available data—including the metrics used to justify claims of progress—led The Long War Journal to conclude that “the overall level of violence in Afghanistan remains much worse today than it was prior to the surge.” Meanwhile, a wave of “insider-attacks,” perpetrated by members of the Afghan security forces, has killed 60 coalition troops this year (compared with 35 last year). Leon Panetta has described these killings as “kind of a last-gasp effort” of the Taliban to resist their inevitable demise. He also remarked, “It’s near the end of their effort to really fully fight back.” It’s hard to say which is worse: our president and defense secretary deliberately misrepresenting the situation in Afghanistan to such a degree, or our president and defense secretary genuinely misunderstanding it to such a degree. If that were true, I asked him, what had it all been for? “I’m a little confused by it,” Rogers said.